Location: the Longonot Crater neighbours the Hell's Gate National Park in the Rift Valley and is only a 2 hours drive away from Nairobi. The park gate is at about 2150 m above sea level. You reach the crater rim at 2560 m and the peak at 2775 m. This peak is also the highest point in the Rift Valley in Kenya. Landscape: this dormant volcano last erupted in 1863. The rim is only accessible on foot on a steep path. There's a good path of over 7 km that takes you completely around the crater rim. In places the path is quite steep. The peak is on the path, so if you walk counter clock wise, you will reach the peak after about one third of the total circumference. The crater is covered with dense bush. Contrary to Crater Lake, there are no springs or lakes in the crater. 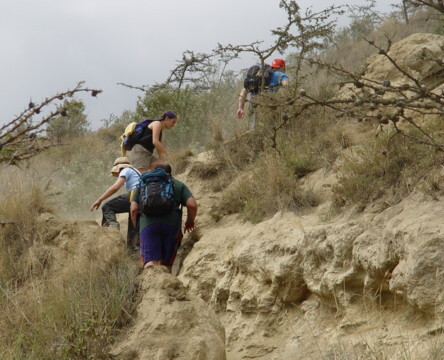 Ascending up to the crater rim will take 1.5 to 2 hours. To go round, count on 3 to 4 hours and about an hour to descend to the park gate. Mammals: the following species can sometimes be seen: buffaloes, elands, zebras, giraffes and Grant's gazelles. The chance is quite high that you will see very few animals. 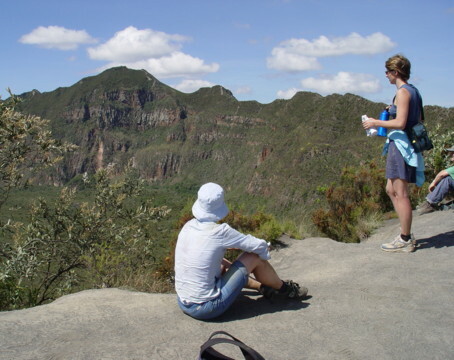 Visitors: Mount Longonot is sometimes visited by school groups. Tourists from abroad are rarely seen on the mountain. If you want to climb Mount Kenya later on your holiday in Kenya, this is an ideal place to test your physical condition. The view from the rim is definitely worth the effort. Accommodation: within the park there's a basic camp site. Along Lake Naivasha, at about 45 min drive from the Longonot National Park, there's accommodation available for all budgets. We prefer to book the Lake Naivasha Country Club or the Lake Naivasha Kongoni Lodge.